Unlock your phone in three steps fast and simple. Permanent and keeps the cell phone's warranty. Valid for all LG models. How to unlock my LG phone with doctorSIM? Once you've requested your unlock code through doctorSIM, you'll shortly receive an e-mail with simple instructions on how to unlock your LG. Follow the instructions carefully to access a hidden menu and unlock your phone. In just a few minutes, you'll have your LG permanently unlocked! Can I still unlock my LG device if I don't know to which network it is locked? Yes, you do not have to specify the original operator. 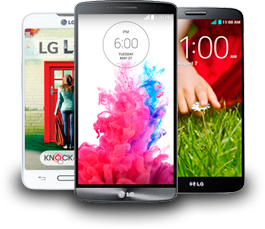 Although this is not a requirement to unlock an LG cell phone if you need to find out because you are planning on buying a second-hand phone, our LG carrier IMEI check will let you know within minutes. Can I unlock my LG if I have run out of unlocking attempts? LG phones without unlocking attempts cannot be unlocked by IMEI. Check you have unlocking attempts remaining on the LG phone. What do the following messages mean: 'Code Accepted' or 'Network Unlock Successful' or 'Not Yet Personalized'? These messages mean your LG cell phone is now unlocked for use on any compatible network in the world. Can I still unlock my LG if I don't know the exact model? Yes, you can! You don't need to know the exact model of your LG as our unlock code and instructions are valid for all models, either smartphones or tablets. However, if you need to know this information for any other reason you can find out using our identify LG phone model check. Are these services reliable? Do I get my money back if they don't work? 100% reliable! In the rare event your LG cannot be unlocked for any reason under doctorSIM's responsibility, we will issue you a full refund. You can also get more information on the security certificates we use on our website. Will my unlocked LG work on any network in the world? Once unlocked by doctorSIM you'll be able to use your LG cell phone on any compatible GSM network in the world as long as the phone has not been blacklisted due to loss, theft or unpaid bill. Our IMEI-based unlocking method is permanent and the phone will never re-lock even if you update the software. How do I know if an LG phone has been blacklisted due to loss, theft or unpaid bill? By using our free LG phone check service which scans the databases of hundreds of network providers or by contacting the network provider to which your LG is locked. Keep in mind that to unlock your LG, you must first remove the device from the blacklist by contacting your network carrier. You will be able to use your LG with any network carrier. Your LG's warranty will remain intact. You can continue to use your phone as normal during the unlocking process. Permanently unlock your LG from the comfort of your home. Easy instructions delivered 24 hours a day, 365 days a year.